When I saw this recipe awhile back on Fabulously Delicious, I was intrigued. All of the components are things I love, yet I had never tried them all together before. Kirsten gives a little background and talks about different variations you can try here, but I followed the recipe she posted pretty much exactly for my first go round. 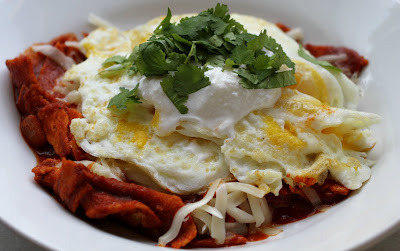 I really liked them and enjoyed the combo of the crispness and spiciness of the tortilla strips with the creamy and cool taste of the eggs, cheese and sour cream. 1. In a large skillet, heat oil over medium heat. Add onion and saute 3 minutes. Add garlic and cook 2 minutes more. Stir in enchilada sauce and all seasonings. Bring to a boil, then reduce heat to low and simmer 30-45 minutes. 2. Meanwhile, in another large skillet, add enough vegetable oil to cover the bottom. Cut tortillas into strips or triangles, and fry in batches until golden. Drain on paper towels and lightly season with salt. 3. Add fried tortilla strips to enchilada sauce. Stir to coat all chips, and let simmer 5 minutes to soften. 4. In a medium skillet, fry eggs to desired doneness. To assemble chilaquiles, place a spoonful of tortillas and sauce on a plate, sprinkle with cheese, and top with eggs. Garnish with cilantro and sour cream. I'm glad you liked them! My recipe is far from perfect - you must try them from a good Mexican place to know how delicious they can be! I think I'm going to try a green sauce/scrambled egg version for Easter brunch.